GALLERIES OF HONEST STORIES, TOTAL SHOOTING FREEDOM, AND FULLY RELAXED CLIENTS IN A FEW SIMPLE STEPS. That’s what Intentional Documentary™ is all about. I used to book "documentary clients," but my work was still a bit… OFF. It felt like they were playing dress-up for the camera. It’s not your fault, or theirs. This approach is still a bit foreign and fear of how the photos can turn out can set in. So, your well-intended clients try to control the outcome by choosing locations and/or activities + even their wardrobe based off what they believe will be better for the camera. They're attached to the outcome of their investment, after all. This easily leads the photography from being the honest story you wanted to preserve to inauthentic and a bit awkward. I’m going to teach you how to nip that in the bud and maintain your documentary shooting approach! Access everything and get started now! If you’ve ever felt captive of client-pleasing that strips away the freedom, pleasure, and soul fuel out of your paid work, keep reading. This is a self-paced program. You'll receive access to the content within 48 hours of purchase. Videos are hosted on a separate site for students. I’ve felt stuck and boxed in creatively and really really really wanting to make the switch to only doing documentary photography, because of how impactful it was for me to have actual memories of what life looked like for my first year of marriage documented. I just haven’t had the tools and knowledge to know what to do. Intentional Documentary™ did that for me. It touches on so many different aspects of documenting for a client. From solidifying and re-invigorating my WHY to practical steps in working with clients to give them the best experience possible. 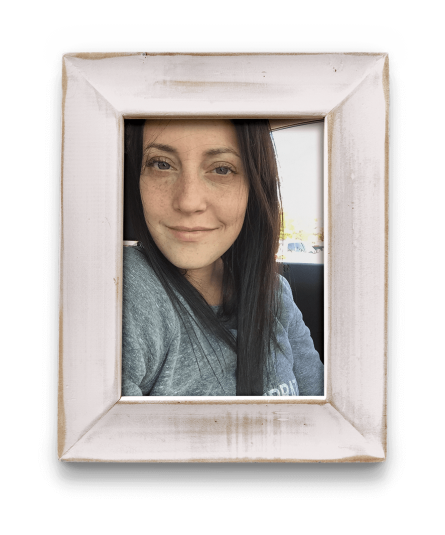 My name is Marie and I’m the Founder of Fearless and Framed®. In 2013, I felt like I had multiple personalities as a photographer. There was the real-story driven, all-emotion work I was recognized for: the photos of my life and family. Then, there was the work I was hired for: loosely directed images, infused with everything I could do to get my clients to laugh, kiss, smile, and appear happy and in love…. All things I thought I had to do to make clients happy. Pretty, but not ME. Inside, I wanted clients to have what I got out of photography: vivid, mental images of their values + living memories in tangible form. Relief + security in photographic form. The only question was how? And oh boy do I have some stories there as I figured it out! With Intentional Documentary™, give YOUR clients galleries full of real memories in the way you feel when you look at your personal work. Put the heart of your work back to the front of your business. 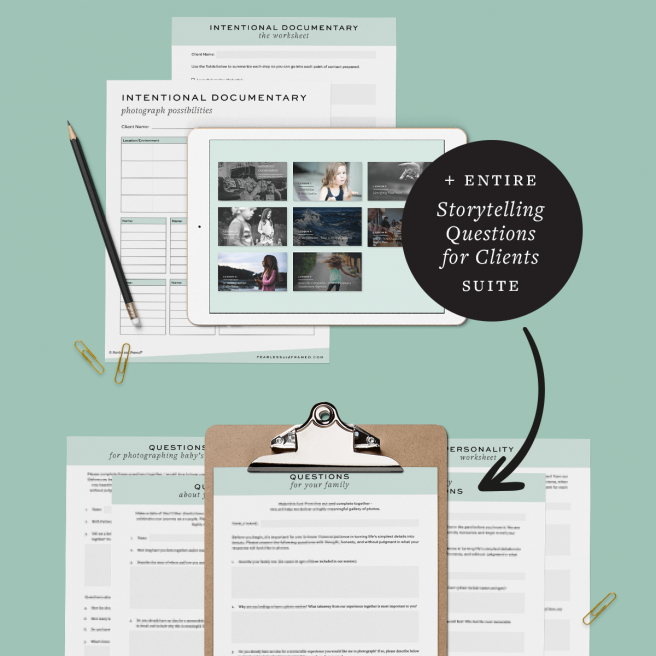 BONUS: The entire Storytelling Questions for Clients collection: Family, Couples, Personality Worksheet, About the Home, & Maternity. You'll get both MS Word + professionally designed, unbranded PDF versions.